Leeks are the milder, sweeter member of the opinion family. Treasured for thousands of years around the world, they are more common in other countries than here in the United States. Somehow we have elevated them to a gourmet vegetable that usually comes at a premium price in the supermarket. Easy to grow, leeks should be in every home garden. Giant Musselburgh Leeks are extremely cold-tolerant which makes them perfect for late harvests or for over-wintering. They form a very thick base with little bulbing, making cleaning easier and offering more weight per plant. Deeply colored blue-green flags stand upright. Mulch well for overwintering in northern regions. 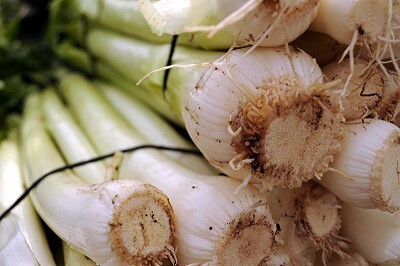 Young Leeks are often braised and eaten as a side dish for dinner. Older fatter Leeks are most often peeled and cooked. They partner perfectly with potatoes and make an incredible potato gratin. In Numbers 11:5 the Israelites longed for Leeks as a change from the sweetish manna they had been eating in the wilderness. "We remember the fish, which we did eat in Egypt freely; the cucumbers, and the melons, and the leeks, and the onions, and the garlic." Leeks make a delicious addition to our Biblical Herb Garden.